Doveryai, no proveryai is a Russian proverb that’s probably more famous in translation than in its original language. “Trust, but verify” was used extensively in various international negotiation settings, and continues to be trotted out as needed. It’s not a bad idea. Trust is good; proof that your trust isn’t unfounded is even better. Where does this proverb apply in the life of a people of faith? Some equate faith with the phrase “leap of faith,” or, as Mark Twain is reputed to have said, “Faith is believing in what you know ain’t true.” Though cleverly put, I doubt that’s true of any person of faith, however untutored. There’s nothing to be gained by clinging to a myth, a falsehood, or a lie. When life is raw and wretched, the only stability to be found is the truth, wherever it exists. When life is raw and wretched, the only stability to be found is the truth, wherever it exists. I thought of this recently as I mused on the necessity of historical, verifiable fact as the foundation for the Christian faith. Of all belief systems, Christianity is the only one that insists its truths must be founded on the historical existence of a person named Jesus, and that further, he historically said and did the things claimed of him. Most importantly, if Jesus didn’t die (really die, dead-as-a-doornail die) and rise again (in a physical body, one that walked, talked, ate, and resumed relationships with his friends), then, as Paul told the Corinthians, “If Christ has not been raised, your faith is futile; you are still in your sins. . . . If only for this life we have hope in Christ, we are of all people most to be pitied” (1 Cor. 15:17, 19). Why pitied? “If believing in Jesus is what gets you through the day,” as many a skeptic has told me, “then good for you. We all have our lucky rabbit’s foot to comfort us; if Jesus is yours, then fine. Just don’t push it on me.” The problem with this argument is that our faith is in things Jesus did; and if he didn’t do them, then the whole thing is useless. Every other faith system—even faith in science, or education, or political power—draws its significance from the good advice it provides its adherents. If you live a certain way, observe a number of important rules, act in accord with these precepts, well, life will be good to you. You will be respected, and possibly revered, for making a difference in the progress of civilization. If not now, definitely later, in another realm where you will get your reward (Islam) or in another incarnation (Hinduism) or in the peace of non-existence (Buddhism) or in your laudatory obit in The New York Times. A Christian’s faith, however, isn’t in the ethical teaching of the Bible (though it’s there, and not wildly different from that of other faiths, as C. S. Lewis demonstrated at the end of his brilliant book The Abolition of Man). Rather, the Christian places his faith, her hope of renewal, his confidence in forgiveness, in the actions of someone else—in Jesus Christ. If he didn’t live as he lived, die as he died, and rise as he promised, then we Christians are spending our lives chasing a fairy tale. Childish! Stupid! Pitiable! It’s for this reason Paul, in that same passage of Corinthians, lists the eyewitnesses of the resurrection as his sources. He was a hardheaded, Roman-educated Jew, conversant in philosophy as well as the Scriptures. But he relied on none of that training. He drew his assurance from the people who saw with their own eyes. Interestingly, as I was considering these things, my Bible reading took me to the end of Matthew, the resurrection of Jesus—a story so familiar that I thought I couldn’t learn anything new from reading it. However, and I apologize for the digression, I’ve been listening to Beethoven’s Egmont Overture as I walk on an older treadmill (one that doesn’t have a TV screen to distract me with cooking shows during my 40 minutes of walking-to-nowhere). The Egmont is one of my favorites. I’ve always imagined the triumphant conclusion of the piece would’ve been a good soundtrack to the resurrection—the angel rolls away the stone and Jesus walks out, joyous, in his resurrected body, the Savior of mankind and firstfruits from the dead. Cue the brass. This time through Matthew, I noticed something. Though it does indeed say an angel came and rolled back the stone (it would’ve been several tons, designed to roll into a declivity in front of the entrance and therefore unmoveable by human agency), to my surprise it does not say “then Jesus walked out of the tomb.” The angel informs the women who have come to visit that “he is not here” (Matt. 28:6), and, in fact, is already on his way to Galilee ahead of them (Matt. 28:7). In colloquial terms, Elvis had already left the building. Jesus didn’t have to wait for the angel to move the stone. He was a real, physical being, but one who could pass through grave clothes without disturbing them, as well as through locked doors (John 20:19). He didn’t need angelic help to get out of the tomb. Why, then, roll away the stone at all? Imagine if the angel had just arrived and sat on the stone, without moving it, and delivered the same message: “He is not here; he is risen, just as he said.” Would the women have believed him? Maybe, maybe not. An angel is probably pretty persuasive. But what about everyone else? Without an open, visibly empty tomb the resurrection was not verifiable. People who claimed to have seen the resurrected Jesus could have been hallucinating. After all, the body was still in the tomb, wasn’t it? 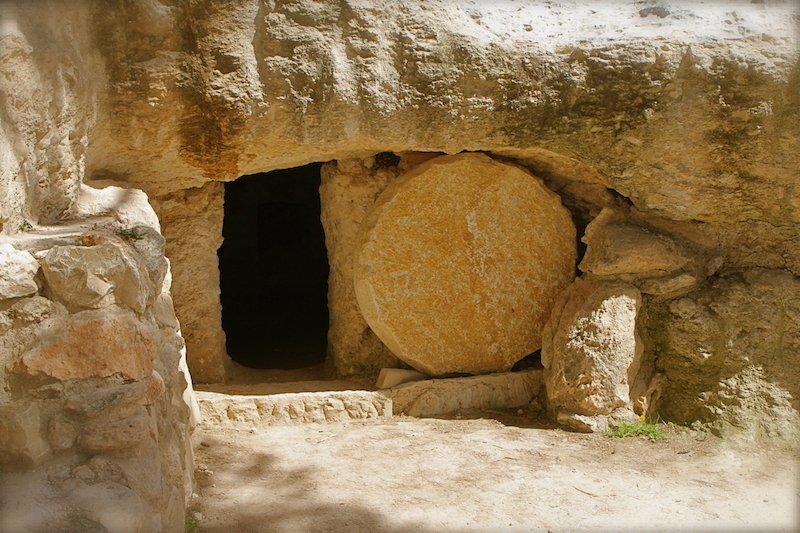 To my surprise, I realized the stone needed to be rolled away not to let Jesus out, but to let us in. Trust, but verify. The resurrection needed to be verified by eyewitnesses, who could testify to the empty tomb and empty clothes. Ours is a faith founded on an event that occurred in space, time, and history, and it began with an angel politely opening the tomb so we could look into the empty space and see he was no longer there. To my surprise, I realized the stone needed to be rolled away not to let Jesus out, but to let us in. So ask your questions, raise your doubts. Christians have nothing to fear from questions, however searching, or doubts, however scathing. History is on our side. It really happened. That changes everything. Editors’ note: This article appeared in the August issue of the Redeemer Report.